SysInfo PDF Repair tool is an excellent way to repair corrupted or damaged PDF files which are created in any version of Adobe Acrobat. It handles high-level of corruption from PDF files with ease and performs maximum possible data recovery from the corrupt PDF files. This SysInfo PDF Recovery software allows users to select single as well as multiple PDF files at a time and scans all the selected files in one go. It takes really very less time to scan multiple PDF files and recovers your crucial data from them. By using this free SysInfo PDF recovery tool, you can easily recover text, images, hyperlinks, tables, forms, charts, shapes, header/footer, page format and many more from the selected PDF files. This SysInfo PDF Repair tool recover PDF files works in a very safe-mode and does not cause any damage to the selected PDF files. It does not overwrite the selected PDF files, whereas it creates new working files at user-defined location to save all the recovered data into them. There are two recovery modes in this SysInfo PDF repair tool to handle different level of corruption. Standard mode for fixing minor and moderate corruption, while advanced mode for severe or major corruption issues. This SysInfo PDF file repair tool can conduct recovery from corrupted PDF files which are saved on any external storage media, such as: floppy disk, CD, DVD etc. This SysInfo PDF Repair tool also allows users to see the preview of recovered data in the preview pane before saving them. It is an easy-to-use tool that requires no prior technical knowledge. Even a novice computer user can use this tool with ease. SysInfo PDF recovery tool supports all major versions of Adobe Acrobat tool and runs smoothly under all Windows based operating systems. Changes: * Single as well as multiple PDF files recovery at a time; * Two recovery modes: Standard Mode for minor corruption and Advanced Mode for severe corruption; * Saves recovered data, i.e. Text and Images, in separate folders; * More interactive and user-friendly graphical interface; etc. 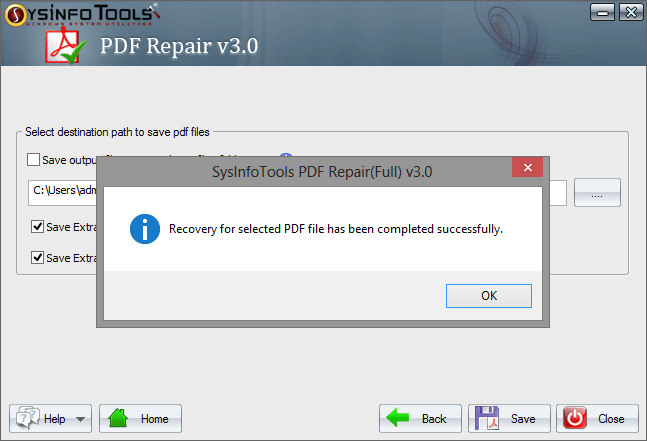 Press release: The updated version of PDF Repair from SysInfo with more interactive GUI and advanced features. SysInfo has updated its PDF Repair software from v2.0 to v3.0. It has an interactive and easy-to-use interface that requires no technical skills. There are two modes of recovery: Standard and Advanced, to handle different level of corruption. The trial version of SysInfoTools PDF Repair software can be freely distributed over the Internet in an uncharged and unchanged form. SysInfoTools PDF Repair Copyright by SysInfoTools Data Recovery. Your Agreement to this License You should carefully read the following terms and conditions before using, installing or distributing this software, unless you have a different license agreement signed by SysInfoTools Data Recovery. If you do not agree to all of the terms and conditions of this License, then: do not copy, install, distribute or use any copy of SysInfoTools PDF Repair with which this License is included, you may return the complete package unused without requesting an activation key, within 30 days after purchase, for a full refund of your payment.